Few things capture the imagination quite like an ocean liner. Among ocean liners, one name stands head and shoulders above all others. 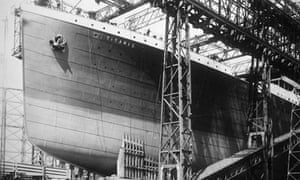 Infamous for being 'unsinkable' and going down on its maiden voyage: the RMS Titanic. 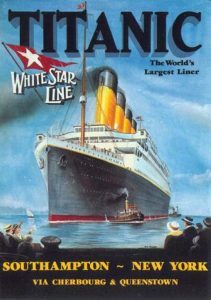 The Titanic was originally ordered in 1904 by White Star Line as part of their Olympic-class of oceanic liners. The Olympic-class, including Olympic, Titanic, and Britannic, were to be the largest and most luxurious liners in the world. Titanic was built in Belfast, Ireland under designs by Thomas Andrew. The ship launched in 1911. A 30-40 foot long electrical control panel, which maintained the lighting, fans and generators on the ship; archaic today, but very impressive for early 20th century. All of the on-board clocks were slaved to the bridge where the captain could adjust them as the ship changed time zones. Telephones which were capable of connecting crew immediately to other parts of the ship. An advanced long-range wireless network capable of sending telegraphs 500 to 2000 miles away depending on conditions. In addition to these innovations, the ship also boasted the most talented crew in their respective fields including the Captain, sailors, wireless operators, engineers, stewards, mail clerks, and many others. People clamored to work on the ship and White Star Line could afford to hire the best of the best. Second and third-class passengers were not out of luck either. Generally speaking, third-class passengers on the Titanic enjoyed non-steerage conditions: two bunks per room with wash basins and bedding similar to what second-class passengers enjoyed. The main difference? All of third-class, over 700 passengers, shared two bathing areas. Yikes! The ship also had numerous dining halls and saloons, all simply furnished but kept immaculately clean. Ocean liners have come a long way since the Titanic sunk on April 14, 1912. Amidst the grief and outrage of the incident, much good came from the disaster in the form of new regulations. Ships were required to provide enough lifeboats for a majority, if not all, passengers and crew. Lifeboat drills and emergency procedures also became commonplace. Radio equipment was to be manned constantly as well, as one of the fatal flaws that night resulted in the radio members on several ships being away from their post. Most enduring, the International Ice Patrol and the International Convention for the Safety of Life at Sea were both established and remain in effect to this day. Looking for something else? The St. Tammany Parish Library is happy to offer our catalogopens a new window for all of your inquiries. Bon voyage!